The protection racket actually open the door for executive perks which dwarf whatever was condoned at Tyco with lavish Roman toga parties and gold bathroom fixtures. The world reserve currency is in the process of upchuck rejection. Anyone wondering why gold has not made new highs during a time when the USDollar is teetering need only look to the official Euro Central Bank gold sales . Thanks to the Gold Anti-Trust Action (GATA) organization for their steady professional reporting on activity behind the scenes. Intrepid Blanchard reports the ECB sold a whopping 76 tonnes of gold bullion in the five weeks ending April 24-th, including 17 tonnes in the fifth week. That is a huge jump over their pattern in the last six months. They clearly waited for a time when the USDollar was exceptionally weak to dump gold. They call it dishoarding, in blatantly irresponsible fashion, since bullion is bank collateral for currency, the banking system, and their economy. These Keystone Gold Cops can only succeed in delaying the inevitable crescendo of a gold breakout. In the process they will destroy their currencys and banking systems. 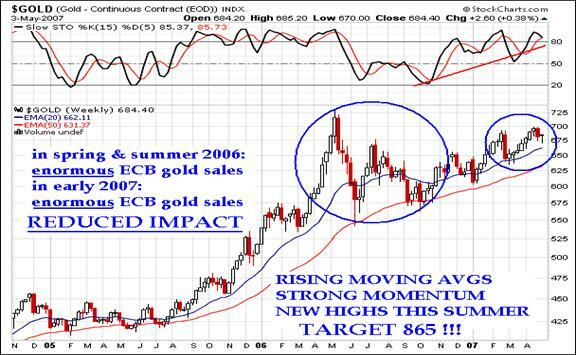 New highs for gold come soon! In the spring of 2006, when the ECB last dumped a tremendous volume of gold bullion on the market, the gold price fell from $730 to $550. So the resilience of gold is vividly clear, powerfully strong. In the same cited five week time span during the most recent ECB gold dump, gold actually rose from $640 to $690, only to take a hit and find some temporarily stability near $680. When official ECB gold sales abate, look for gold to easily surpass the $700 mark and make new highs. Pressure is relentless and ECB sales will dwindle. Gold will continue to be disgorged from the vaults of these crippled and mindless central banks, intent on supporting an unsustainable fiat system. Experts believe Western banks are underwritten by gold pledges from the US Dept of Treasury in what is called in Orwellian style ‘deep storage gold' to mean future mine output. But there is much more to the story. Enter Barrick Gold, self-admitted agents for the Western central banks. Barrick exited two million ounces of gold forward contracts from its acidic black hole hedge book in the first quarter of 2007, thus incurring a whopping $557 million loss. Why a certain prominent Toronto analyst (who provides excellent information about China regularly) supports this stock is beyond me. The contract price of exited contracts was 41% below current gold prices! Barrick fetched a mere $386 per oz in Q1, 28% below a year ago. The average market gold price during Q1 was $652.8 per oz. Barrick announced another half a million ounces to be sold from their hedge book in Q2. In 2006, they exited 9.4 million oz in gold hedge book contracts, comprising 62% of global total. Without any doubt, a coordination took place between this scummy company and Western central banks so as to obstruct any gold rally to new highs. They wanted at all costs to avert a gathering storm for the USDollar, confirmed by a gold price explosion. The ECB has agreed to limit its gold bullion sales to 500 tonnes annually, but experts do NOT expect them to come close to their permitted limit. What's more, Australian miner Lihir Gold announced a nearly $1 billion secondary dilutive stock issuance in order to close its hedge book, repay debt, and fund expansion. They will close a 934.5k ounce forward contract set at $343/oz, and repay a 480k ounce gold loan at $449/oz, each a disaster. Together, Barrick and Lihir will remove $1.1 billion in gold off the market to worsen the critical supply shortage already. Furthermore, a global survey by Mitsui of 118 producers revealed a 25% decline in forward contracts sold by gold miners in 2006. So hedging is lessened, often reversed, when misguided desperate central banks are running low of bullion to dump, much like secure ballast on a ship at sea during a big storm. In a February 2006 article of mine titled “Inelastic Gold Supply” (click here ), an attempt was made to explain how gold mine output would not rise in ANY significant way with a higher gold price. Many factors were covered, from hedge books to rising costs to labor shortages. WE ARE SEEING THAT PRECISELY NOW. The recently applied trick for heavily hedged miners (see Lihir Gold of Australia ) is to dilute the stock or to burden the debt load in order to finance the hedge book buybacks. Either way, the stock looks less attractive. If energy firms are not buying back shares instead of investing in their companies, we see gold miners buying back their acidic hedge books instead of investing in their companies. Outcry should be shrill and endless, except that Barrick answers to central banks, not share holders. And the big energy firms answer to the White House and Military. The major point is that higher gold price is NOT resulting in higher gold output. This is the ESSENCE of inelasticity. Barrick and the other corrupt financial appendages to bankers (I mean miners) testify to the failure to produce greater amount of gold bullion at higher prices. An unflattering portrayal of Barrick Gold was given 15 months ago, now firmly established. For those Americans who slept through chemisty, math, and other science classes, if you mix acid with an alkaloid (its opposite in hydrogen surplus), you get harmless water. Barrick Gold hedge book losses have begun now to be quantified. Don't expect setbacks are over for either this firm or other hedge device abusers. Barrick was once accused of being a financial firm masquerading as a gold miner , for the unexpressed purpose of selling forward gold contracts far in excess of actual production. Its entire existence is an anomaly, most likely from its inception being a corporate illicit hedge apparatus, a gold cartel tool. Their senior management hailed from financial firms, not mining firms, and surely not of geologist background. Their central unstated non-chartered modus operandi was founded in neglect of their mine operations, sure to exacerbate their future (like now) gold output. Their reported 13 million gold ounce short position vastly eclipses any future production schedule, an outpouring of acid on their balance sheet of as much as $560 million lost in a single recent quarter. To put that quantity into perspective, 13 million oz short position exceeds all gold exchange traded fund (ETF) holdings. In the past six quarters, try imaging the harsh reality of a $1000 million loss for Barrick. Anyone who cannot conclude that their acquisition of Placer Dome was motivated by a desire to blend acid with some valid production and cash (alkaloid) is naïve at best or blind at worst. Their combined short position is 21 million oz gold. To date, a $3 billion loss on the Barrick books is staggering, but that amount is likely less than half of the sum necessary to close out their "ingenious" hedge book. Again, perspective is needed. Such a cumulative loss over the years offsets the entire profit generated by Barrick from its ill-designed inception. One can serve up Barrick in an MBA business school program as the quintessential hedge disaster in all of history . My view is that at least one mining firm, and very probably Barrick, will blow up in the next derivative disaster with full publicity and notoriety. My conjecture is that Fanny Mae already blew up, but its publicity has been smothered in secrecy under the aegis of the US Federal Reserve. My other evil conjecture is that the USFed is illicitly transforming Fanny Mae mortgage backed bonds into US Treasury Bonds. Does anyone watch? Does anyone care? Is the law even apply? Are laws relevant to the game anyway? Finally, the point to be gained from this line of thought is that Barrick, like some other gold miners, has been forced to exhaust its precious cash position. They have therefore denied themselves needed funds for mining operations, to satisfy their charter for gold production (seemingly a nuisance), in order to secure current precious metal output. They aint producing anywhere near as much gold, silver, and other byproduct metals due to their greed, stupidity, arrogance, and fractured fallacious phony business plan. The irony is that first, miners are buyers of gold contracts in a very very big way. Second, as the gold price rises, they might actually produce LESS GOLD. They are being bled dry of cash. A mining stock investor must lick chops, salivate, and find glee in their highly deserved misery. Overly hedged gold miners actually produce less with higher prices. Numerous points were made in that article of February 2006, each now prominently cited as part of a systemic problem. At the market bottom, enthusiasm with demand was absent, typical of an inelastic system. As the market advances, supply is curiously absent as well, again typical of an inelastic system. Mine output globally for gold was down in 2006, despite a higher gold price. Most people are familiar with the basics of the supply & demand curve. Well, except perhaps economists, who re-invent their craft as they go along, fully sacrificing time-tested principles as they "sell out" and defend their interests. Their self-serving analyses disseminated to the public are routine landscape shrubbery. We are often subjected to questionable economist arguments... Whenever a convenient spin is needed on an economic subject, it is alarming how often either supply or demand is ignored, as an oversight (unintended or blatant), or a distortion (accidental or planned) within an argument. Anyone who cannot conclude that their acquisition of Placer Dome was motivated by a desire to blend acid with some valid production and cash (alkaloid) is naïve at best or blind at worst. Their [Barrick & Placer] combined short position is 21 million oz gold. To date, a $3 billion loss on the Barrick books is staggering, but that amount is likely less than half of the sum necessary to close out their "ingenious" hedge book. Don Lindsay, CEO of Teck Cominco, paints a bleak labor picture… Lindsay traced the origins of the labor shortage back to 1997. According to him, the feeder systems were disrupted by the Bre-X scandal, the Asian Meltdown, and the commodity bear market. He expects demand to remain robust from China . Keep in mind that over two thirds of geologists in the world hail from Canadian schools. So if professional shortages exist in Canada , we have a very large problem indeed. Mirroring the crude oil roughneck labor shortage is the mining labor shortage. Another parallel exists. Lindsay points out that within a decade, 60% of all Canadian scientists working the geosciences will be at least 65 years of age. The overall impact is surely that new mine deposits will take longer to find, longer to produce, and cost more. Contrast for a moment to the year 2001, when gold was at its bottom $265 price. Nobody could … care less, as financial rags ignored the tremendous bargain, as dealers had to beg customers to purchase the barbarous relic in any form. So at the lowest price, gold went begging with little interest. So at the highest price, gold garnered enormous interest and enthusiasm. That is backwards, grasshopper. Let us all rejoice for the screwed up self-destructive overly hedged gold miners. May they enjoy a slow death from a thousand cuts as they endlessly cover their acidic hedge books, and add to relentless demand from their own folly. It is my theory that they will never fully cover such hedge books. They will endlessly purchase, endlessly move their "line in the sand" to incrementally higher price levels, endlessly avert death by buying a little more time. Barrick is typical of large stodgy producers. Both Barrick and Newmont report much higher average cost of mining gold per ounce, compared to just a year ago. Output for Barrick is down also, from 8.6 million oz in 2006 to an expected 8.25moz this year. These large lumbering giants hold back the HUI stock index, since overweighted. They discover next to nothing, gobble up smaller firms, acquire their gold (not discovery), and assume gigantic hedge book losses. In short, they create a false impression for smaller, smarter, more nimble, and less burdened gold miners to invest in. The nightmare for Barrick Gold is not over. In fact, it is only half complete. After their desperate grab for Placer Dome, their combined hedge book was 21 million ounces (moz) gold. In 2006, they covered 9.4 moz on that disastrous millstone around their financial balance sheet neck. In Q1 they covered 2.0 moz. They state plans to cover another 0.5 moz in the next Q2 quarter. So by mid-2007 they will have covered 11.9 moz of their 21 moz total hedge book. THEY ARE HALF DONE WITH THEIR NIGHTMARE. So Ing and his ilk still like this acid-ridden firm which needs tons of milk to form water? Methinks not, as one can smell compromise. In the next few weeks, gold will cut through the $700 price mark like a quiet hot knife. It would have done so already, if not for the COLLUSION between Barrick and Western central banks. The Euro Central Bank cannot keep its pace of official gold sales. They will undoubtedly NOT SELL as much as the corrupt Washington Accord dictates as allowable. This is much more destructive than burning the home furniture for winter heat. It is akin to burning the wooden support beams, burning the wooden load bearing pillars, burning the basement den, burning the recreation room, destroying the entire foundation to the home!!! The contractors are the corrupt gold miners who masquerade as miners, but are actually gold cartel agents. Imagine the wisdom of selling off your entire collateral for the currency and banking system, in utter desperation, hopelessness, and anguish!!! Keep up the hedge book covering, guys. We have been counting on you for a couple years. Continue to sop up and exhaust supply, wherever it comes from. BECAUSE WHEN YOU GUYS REST (COVERING HEDGES, DUMPING ECB GOLD BULLION), GOLD WILL ZIP EVER HIGHER. Its destiny is to do so.